ThirstyChoice Hague Quality Water Softener is The Right Solution™ for you. 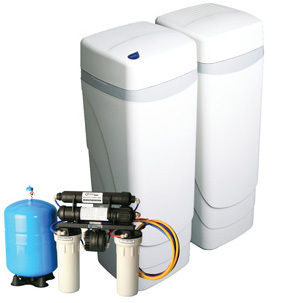 The Hague WaterMax® (shown on right) water softener is a custom designed whole house water treatment system, offering your family a patented approach to solving specific water needs. Multi-compartment media tank for complete flexibility in media configuration, plus more usable resin capacity. On-demand regenerating by calendar or by exact water usage. Super quiet control valve (with only one internal moving part), ensuring long life and reliable operations. Hague Quality Water® proudly carries the Water Quality Association’s Gold Seal on all products. For all these reasons, The WaterMax® is The Right Solution™ for all your family’s water treatment needs. Please browse this website for additional product and benefit information. Use the contact us link to further explore the Hague water softener.